Thank You for joining us on this Canoeing and Kayak Coverage! Stay tuned to Sportskeeda for more updates! Let's hope they get rewarded soon in the remaining events! The Indian's put up a good show but their efforts fell in vain. All chances are not yet over as there are the 200m and 500m events remaining to be held over the next 3 days! India misses out on a medal in all the Finals event today. It's China, Kazakhstan, Uzbekistan in the top 3 slots once more! The Indian duo finish 6th in 3:56:477 in the C2 1000m Men's final. The Indians miss out on a medal in this by a fraction of a few seconds! The Indian duo are pushing up the ranking list and are at the 5th spot! As we approach the 750m mark, India clocks it in 2:53:23! It's China in the lead yet again. At the end of 500m, they clock 1:53:93! The Indian duo clock it in 55.69 and are ranked 6th now! And with that we have the results of the first 250 m of the race! We'll find out in a tiny bit. So don't go anywhere! Can they get a medal for India? Next up we have Canoe C2 Men's 1000m race where Gaurav Tomar and Sunil Singh will be competing in the finals! The Chinese duo finishes in 3:23:601 and the Indians notch a 3:48:627 touchdown. 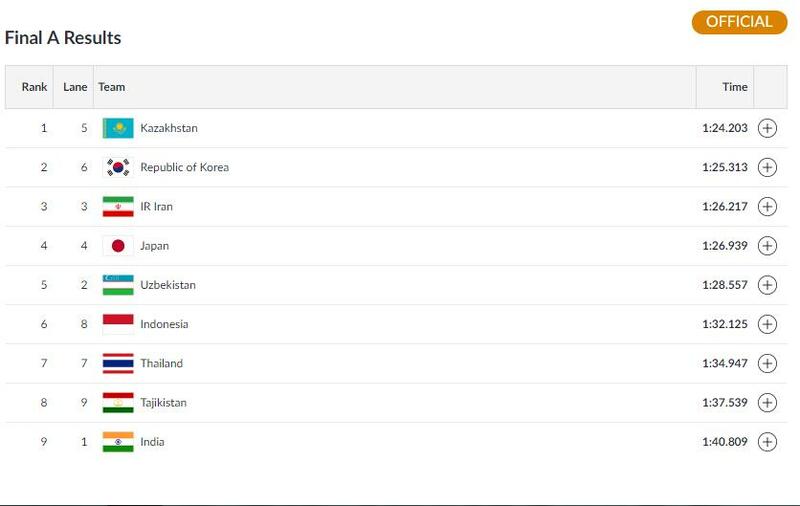 It's China, Kazakhstan, Uzbekistan who take the top 3 slots and India misses out on a medal in this too. The Indians need to pull up FAST! Now they have moved on to 750 m and they clock it in 2:51:84!! At the end of 500m, the Indian duo clock a 1:50:95! Singh-Arambam come up with 50.28! The K2 Men's 1000m Race has begun! Can the duo extend their winning streak in the Finals now and win a medal? Let's find out. Following that we will have the C2 1000m Men's Race! We are a few minutes away from beginning the K2 1000m Men's Race! India has two more shots at a medal today in Canoe and Kayak! In some time we'll be back again with the K2 1000m Men race where Naocha Singh and Ching Sing Arambam will be competing! Soniya Devi fails to convert her final dash to a medal. At the end of 500m, the Chinese woman clocks the gold medal win in 1:59:468. It's China as usual who has assumed the lead. The next event we have is the Kayak Single K1 500 m Women's race where Soniya Devi will be competing! In K4 500m Men's event, it's Kazakhstan, Republic of Korea and Islamic Republic of Iran who take the top three slots and get a gold, silver, bronze respectively. China fires away to a gold in the C2 Women's 500m category with a 2:02:512 touchdown. Meanwhile in the Canoe Double 500 m Women's C2 event, Inoacha Devi-Anjali Bashisth finish 8th with a 2:18:924 timing. Kazakhstan raced ahead to cover the same distance in 41:10. At the end of 250m, India clocks a 48.24 second touchdown. Kazakhstan is leading the way in this event! Beginning the day is the K4 500 m Men's Finals where India is currently racing. A very good morning to everyone! We have a list of canoe and kayak Finals scheduled today! Starting off the morning will be the Indian kayaking team who are into the finals. We'll be having the K4 500m Men Finals, the K4 500m Women's Finals today! 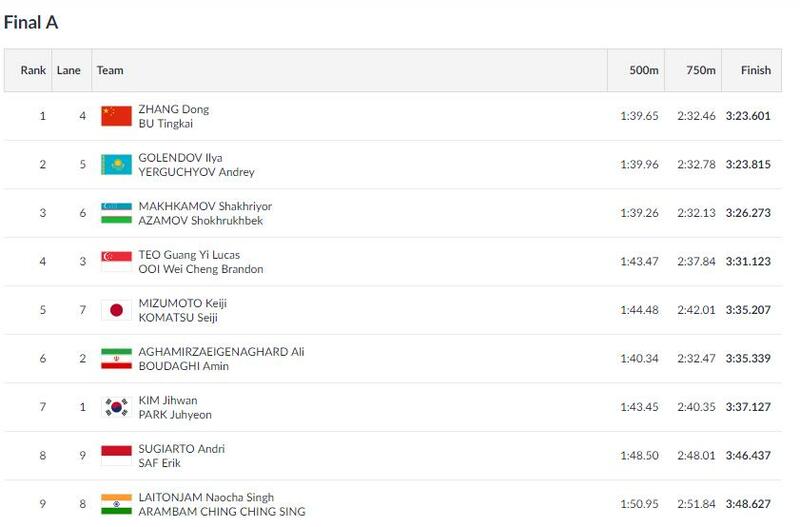 Along with that we have Naocha Singh and Ching Singh Arambam in the K2 1000m Men Finals and Gaurav Tomar and Sunil Singh will try their best in the Canoe Double C2 1000m Finals today! All eyes are cast to the water as the Indian canoe and kayak teams set forth to bring glory to India in their finals.